The 71st World Health Assembly will take place in a crucial year for cardiovascular disease (CVD), and the World Heart Federation will be following closely as key decisions are being made around CVD-related issues. We look forward with great anticipation to discussions on the Third UN High-level Meeting on NCDs, which will take place in New York on 27 September 2018 – a unique opportunity for governments to commit to greater actions to reduce their burden of cardiovascular disease. We also look forward to discussions on a Global Action Plan for Physical Activity, given the important link between physical inactivity and heart disease. Governments will also discuss a Resolution on Rheumatic Fever and Rheumatic Heart Disease. This is a condition on which WHF has been advocating for many years and we are delighted that RHD is being recognized as a global health priority. During the week, we will be co-hosting two side events: Positioning Circulatory Health in Universal Health Coverage: The Case for Hypertension and United to End Rheumatic Heart Disease. You can find out more about these events and how to register below. Finally, the World Heart Federation will be running some heart health-related activites at Walk the Talk: the Health for All Challenge, a WHO event which aims to engage WHA delegates, the United Nations family, non-State actors and the Geneva community in a global movement to promote health through physical activity. Join the Global Coalition for Circulatory Health and a diverse group of speakers and participants to learn how universal health coverage can be made to work for circulatory health and for people living with hypertension. Six speakers, including global public health experts, government officials, frontline health workers and patients, will unpack the reality of pursuing universal health coverage for circulatory health in diverse health systems, and will provide real-life examples of managing and/or living with hypertension. We will send out the programme in the coming weeks. Lunch will be provided at the event. This side event, organized by RHD Action – of which the World Heart Federation is a founding member – will focus on the WHO Resolution and the positive impact it can have both for people living with RHD and for frontline health workers delivering vital RHD services around the world. We will share the programme in the coming weeks. 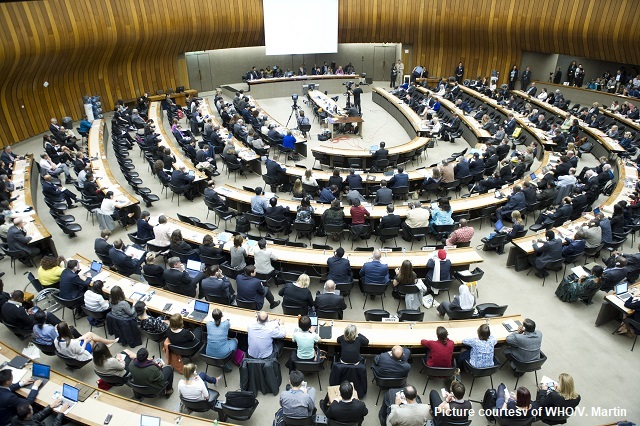 If any of your representatives are in Geneva for this event and would like to attend, please click here to register or email advocacy@worldheart.org for more information. On 20 May, the World Health Organization is staging a major health promotion event in Geneva named Walk the Talk: the Health for All Challenge. This free walk/run event is open to people of all ages and abilities and be held over three distances (short 3 kilometres, medium 5 kilometres and long 8 kilometres). WHF will have a stand at the Place des Nations, in front of the main United Nations building in Geneva, where we are planning a number of heart health-related activities. We want to make sure the cardiovascular community has a strong presence on the day, and would be thrilled if you could join us! The WHF Advocacy, Communications and Programme Teams have recorded an informational webinar to brief WHF Members on the 71st World Health Assembly. This webinar discusses key agenda items such as the Third UN High-level Meeting on NCDs in 2018 and the Resolution on Rheumatic Fever and Rheumatic Heart Disease. It also contains information on side events, and looks ahead to activities on World No Tobacco Day (31 May).